Smartwatches are obviously here to stay. The smart wearable concept has been the object of experimentation for quite some time but it's only now that it really picks up the pace of development. It seems that every major manufacturer is on board this latest fad, despite the glaring conceptual flaws in the suggested usage scenarios. But we digress. The discussion whether smartwatches make sense is wide open and we wouldn't like to get too deep into that. Instead, in this review we focused on the topic of whether the Samsung Gear S makes sense and whether it's up to tasks it has taken upon itself. 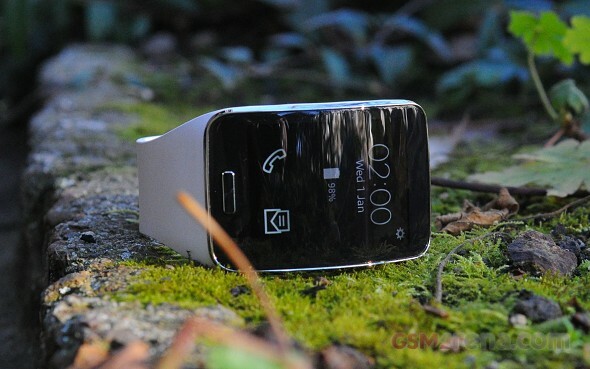 The Samsung Gear S is definitely a very cool piece of tech. Samsung has clearly invested a lot of effort into the feature packed device, but they might have gone a bit overboard. The potential is definitely there. With a gorgeous Super AMOLED display, a powerful Snapdragon 400 CPU, 512MB of RAM and a streamlined Tizen OS, this smartwatch has a lot to show and it delivers stellar performance. The only problem is that it might have ventured a bit too far into smartphone territory and bit off more than it can handle. The Gear S can seems undecided on its own nature - at times it behaves like the standalone, almost full-featured device, it was pitched as, while at other times it's nothing more than an glorified smartphone extension. Samsung have undoubtedly made a bold step into uncharted wearable territory but the Gear S will be paying the price. Its proprietary, closed-up nature, coupled with the total dependence on a partnering Samsung handset, leaves the Gear S at a great marketing disadvantage as compared to its Android Wear-powered competitors, like the LG G Watch R and the Moto 360. It also comes with a significantly higher price tag, with little to show for it in terms of build quality and usability. The GPS chip, the UV sensor and the Wi-Fi connectivity work just fine but seem redundant and ramp up the device price. The battery will get you through 24 hours with economic use. The backup cell inside the dock helps while you're on the go, but battery life is generally impractically short. Tizen is slick, and it looks and behaves a lot like TouchWiz. It does however have a small library of available apps. The app ecosystem is limited to what Samsung has to offer. Fairly advanced apps are available, but nowhere near what Android Wear offers. 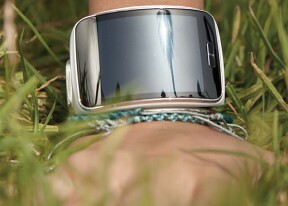 The device works fine as a standalone smart wearable in terms of calling and messaging, but using it with a SIM card and a data plan sometimes gets confusing due to its ability to also use the phone's internet connection and Wi-Fi; it's also a serious investment to make for the basic features it offers. It seems that everything boils down to the point of view. As a smartwatch, the Gear S definitely holds its own and offers interesting features that have all the potential to catch on. As an independent wearable smartphone it's far from it, plagued by its poor battery life and dependency on a Samsung-made smartphone for all sorts of tasks. If you already own a Samsung smartphone, using the Gear S is intuitive and the two work together naturally. Having the Gear S certainly presents a lot of interesting new concepts for loyal fans, developers and tech enthusiasts alike. For regular users perhaps the Gear S is a bit of an overkill. It's got way more wireless radios than it really needs, which bring the price up and affect the battery life. For this crowd, we would probably have to recommend something from the Android Wear front. The Gear S is certainly a great device but only if you approach this unconventional gadget with the right set of expectations.